I hope you all had a great Father's Day celebration with your families. An interesting fact about Father's Day is that when it comes to recognizing parents, dads drew the short straw compared to moms. Father's Day is a relatively new holiday having been signed into law in 1972 by President Nixon, while Mother's Day was established nearly 60 years earlier in 1914 by President Wilson. While there may have been a delay in recognizing dads, there will be no delay in thanking Federation Members who have contributed mightily recently on your behalf. The 25th Annual Litigation Management College was held in Philadelphia last month. The Deans that ran the program this year include Mike Schroeder, Todd Roberts, April Elkovitch, Kelly Dalmass, David Governo, Matt Cairns, Robert Moore and Deb Varner. Leaders of the Graduate Program include Lauren Curtis and Bill Kautter. We held a regional meeting in Chicago last week and it was a tremendous success. The half day substantive program and networking opportunities were terrific. Dan McGrath organized the meeting and actually hosted the event as well at Hinshaw's new offices. A big thanks goes out to Craig Marvinney for his hard work with the Federation Flyer and for the soon to be released 50 State Claims Professional Compendium. Also assisting with the Compendium include April Elkovitch, Casey Stansbury and Frank Ramos in addition to the many different authors. The Annual Meeting (July 29 - August 4) is less than two months away and it is one you do not want to miss. Todd and Debbie Roberts have planned an unforgettable experience for you and the entire family at one of Hawaii's top resorts. Bob Christie has a fantastic program planned and along with the section programs - you will come back a better lawyer than you were before. It is not too late to sign up, but hurry as hotel rooms are going quickly. At the Annual Meeting we give out several awards including the Counsel Connect award that recognizes those that have referred business out to other Federation Members. If you have someone that has sent you business, please let us know so that we can recognize them. Finally, I want to let you know that the transition to the new Executive Director is going well. Bernie Heinze has been working tirelessly to ensure that the Federation maintains its position as the preeminent defense organization. You will love his ideas and enthusiasm that he brings to the organization. I look forward to seeing each of you in Maui! 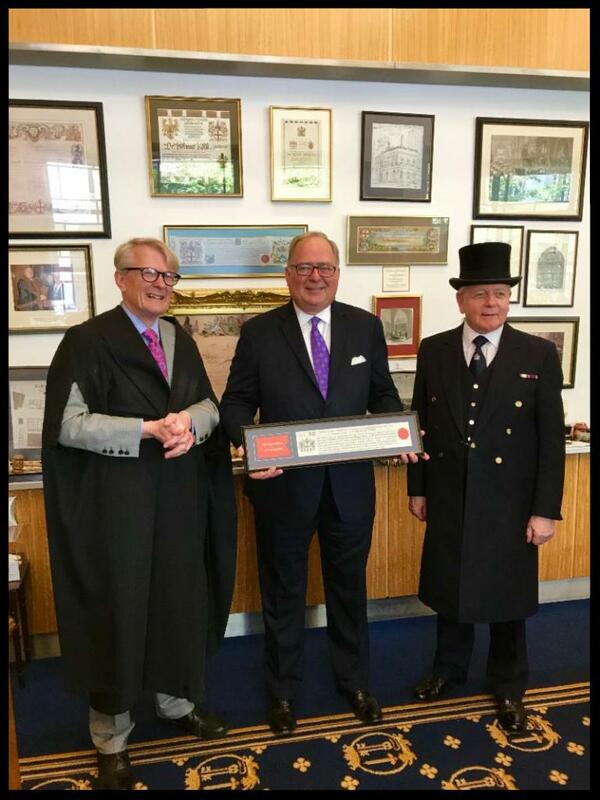 FDCC Executive Director Receives Prestigious "Freedom of London"
The Federation congratulates our Executive Director, Bernd G. Heinze, Esq., who was granted the "Freedom of London" on June 11, 2018 by the Chamberlain's Court in London. The Honorable Murray Craig, Clerk of the Chamberlain's Court (left), accompanied by the Court's Ward Beadle (right) presented the Freedom to Bernie in a ceremony dating back to 1237 when it was first presented. During the time of the 13th century, the recipient of the Freedom was someone who was not the property of a feudal lord but enjoyed privileges such as the right to earn money and own land. Town dwellers who were protected by the charter of their town or city were often free - hence the term 'freedom' of the City. From the Middle Ages and the Victorian era, the Freedom was the right to trade, enabling members of a Guild or Livery Companies of the City to carry out their trade or craft in the Square Mile. A person possessing the Freedom was known to be of high integrity, a person of their word, and whose products or services were of the highest possible standards. Other recipients of the Freedom include Theodore Roosevelt and other past presidents, Dame Judy Dench, Actor Colin Furth, Nelson Mandela, Prime Minister Margaret Thatcher, Lord Nelson, and Bob Geldof. We are proud of Bernie's recognition, and commend his past professional and personal activities, as well as those he and his team are now undertaking on behalf of our members, and in advancing the FDCC domestically and internationally.